Red Bulls II continued their undefeated start to the season as a trio of players found the net for the hosts against Memphis 901 FC at MSU Soccer Park. Memphis took the lead in the 11th minute when former Red Bulls Academy standout Adam Najem finished from close range off a cross by Duane Muckette. New York hit back seven minutes later on a fierce volley by Jared Stroud. 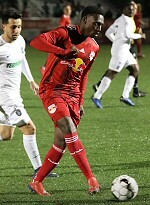 Red Bulls II then took the lead in the first minute of first-half stoppage time as Tom Barlow cleaned up a close-range rebound for his third goal of the season. They added a third in the 56th minute when Derrick Etienne Jr. tucked home a finish after Brian White had hit the crossbar. 901 FC answered five minutes later as captain Marc Burch powered home a free kick from 20 yards. Barlow had a late penalty kick saved by Memphis goalkeeper Jeff Caldwell in second-half stoppage time. New York held firm defensively to claim its second win of the season.